One of the best things about my late lunch breaks at work, is the chance to go wander around stores. I don't always buy the things I love, but I do sometimes! *wink wink* I wanted to share my favorite things I did end up putting in my basket! All In Good Taste // Once again, Kate Spade knocked it out of the park. I love a good book on etiquette, party planning, recipes, and fun ideas! I can't help but constantly pour myself over this book every night! It is a perfect coffee table book, but also a really good read. 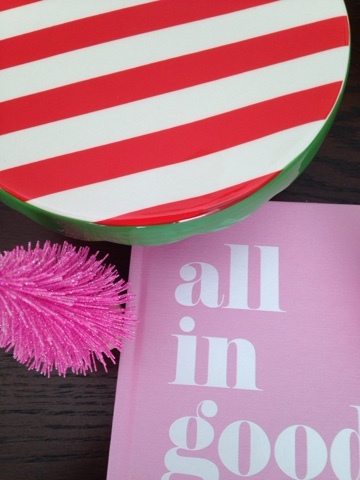 I want to throw a Kate Spade inspired party! I mean who wouldn't!? This book gives you everything you need to know and discusses my favorite thing, wine and cheese! Check this book out for a really good read and a great spot for ideas! 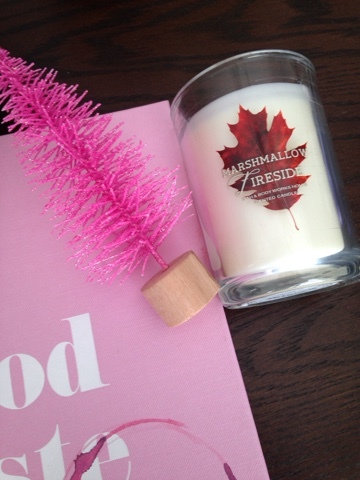 Marshmallow Fireside Candle // I went shopping recently at White Barn and I was overwhelmed by the smell of the store. It was the most cozy and comfy smell that made me never want to leave. I had a coupon for a free mini candle, so I tried this scent out. Ahh-mazing! I imagine it burning and I wear fuzzy socks and sit by my fireplace. If you want something delicious and perfect for the winter, this one is for you. Not only does it smell amazing, the art on the candle is super cute! Love the darling little snowman! Target Dollar Section // Everyone knows Target has the best dollar section and it is even better right now! Christmas has taken over the aisle and boy are the decorations darling! So far, I have purchased a plaid dog collar with gold pieces, a striped cookie platter, plaid straws, and a little Christmas light garland! They are all less than $3 and super adorable. I want to visit the section multiple times a week, because it changes so often! If you go to Target soon, make sure to bring your wallet! Pink Christmas Trees // I love love pink Christmas decor, but I have never pulled the trigger on purchasing any until this year. I found these darling little bottle brush trees at Target that are going to look amazing in my office! They're a touch sparkly, a touch classy, and a whole lot of perfect! I love the little bit of wood on the bottom to make it sturdy and a bit of earthiness! I can hardly wait to decorate for Christmas, but I must wait! Only a few more weeks! I am absolutely in love with Target's dollar section - especially with all of their holiday stuff right now! I'm not a big candle girl but I love all things marshmallow so I think that candle calls my name! And a Kate Spade inspired party? Ummm YES! That book sounds amazing. I love the dollar section and candles. Also, that book looks too cute and I kind of want my bridal shower to be Kate Spade inspired. Soooo .. I have not been to the dollar section since they re-branded and maybe should stay away because I heard there is so much cuteness! I've heard All in Good Taste is a great entertainment read. I have the Kate Spade coffee table books from the past two years and definitely want to add this next one to my collection. love the treats that you picked up, especially the candle!! These are great finds! I really want to read that book now! I work right near a mall and always take a late lunch so I can walk around and distress. Definitely a perk of my work! I've been eyeing that book for some time... I might need to cave and finally get it! Such a cute book! Love! The Target dollar section is the place to be! I love it! I love the target dollar section! I've been dying for a new candle and I love the target dollar section.. i'm going on thursday! Wow!!! I love your notebook so much! I'm addicted to them :) I bet that candle smells heavenly! I'm not a big candle fan, but that scent sounds so amazing that maybe I should become one. The marshmallow fireside is one of my all time favorite candles!! It smells AMAZING! I love these items!! I feel like I need that Kate Spade coffee table book- so pretty and it sounds like a great read! I am not quite ready for Christmas decor, but I will absolutely check out Target when I'm ready. Your finds sound adorable. YESSS Marshmallow Fireside! I wonder if it's available in wax melt form? All In Good Taste sounds like a book that needs to be on my shelf! I can't wait to check it out. Also, that candle sounds like it needs to be in my house right now. That is great, nothing can be better than having a party at bars and restaurants. I recently attended a party organized by my friend at best Chicago venues and it was really a wonderful party with lots of fun.